The Aletsch Glacier is 23km long, as much as 1000 meters deep, and in 2001 the Jungfrau-Aletsch protected area was made a UNESCO World Heritage Site. The reason to run alongside this glacier is for the beauty of such a sea of ice, to witness the scale, to see what a glacier can do to a landscape, and of course to try to comprehend what the melting of these glaciers means for the environment. The whole experience of being in such a place is staggering. And the trail could not be better for running. As of the summer of 2017, large sections of trail between Riederalp and Mossfluh have been closed due to slope instability. Re-routing may be necessary, but being Switzerland, markers will guide you to be able to continue on. 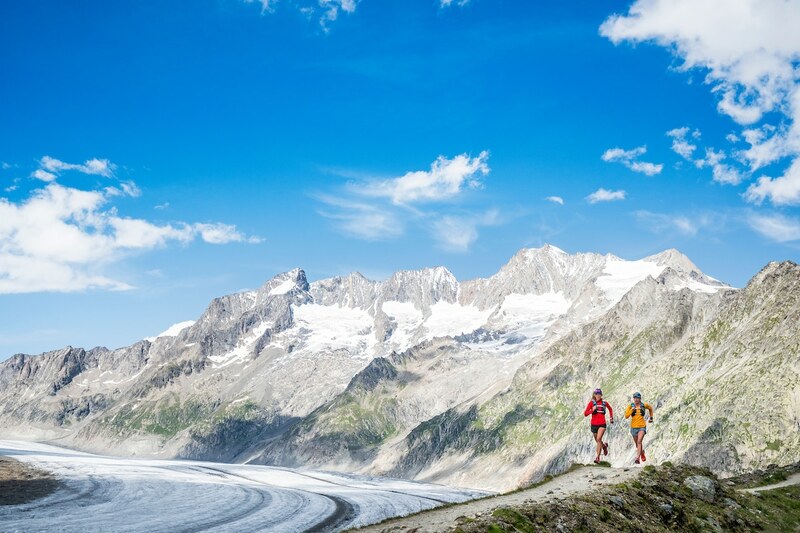 For more photos and info on the run, visit the Bettmeralp Aletschgletscher page on Elevation. TIP: The village of Bettmeralp is a great place to wake up. Consider staying the night and having at least part of a second day to explore.